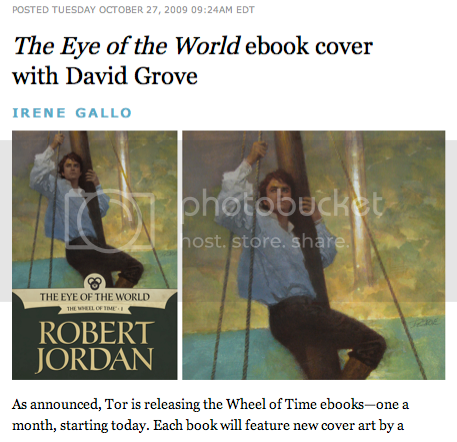 I talk a bit about the beginings of the Wheel of Time ebook cover program and working on The Eye of the World ebook on Tor.com. "....It seemed a natural to start the series with a portrait of a young Rand beginning an epic journey, the scope of which he could perhaps sense but not truly grasp. David’s luminescent paint lights Rand from within. In a way, it seems to be a portrait of Rand best seen at this time, when readers know so much about what lies ahead of him..."
I found your blog on google and read a few Thanks for the information you mentioned here, I'm looking forward to see your future posts. Cheers !! Please come visit my site Las Vegas Business Directory when you got time. I found your blog on google and read a few Thanks for the information you mentioned here, I'm looking forward to see your future posts. Cheers !! Please come visit my site Phone Directory Of Las Vegas City Nevada NV State when you got time.